Cofidis team is racing on the Tour de France with very special Mavic wheels, Roues Artisanales could get thanks to a reader a picture of the prototype used by some lucky riders. 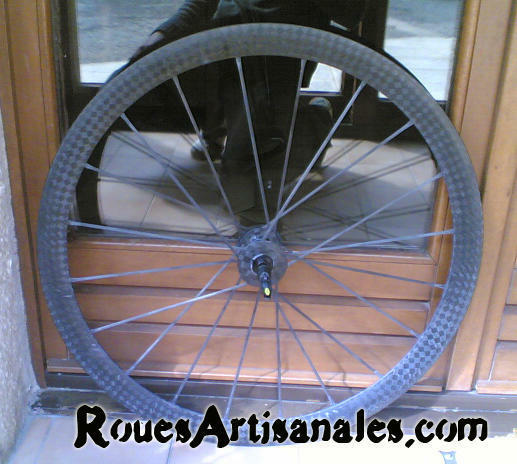 This wheel whose carbon weave is 12K as Corima aéro 2006 is however different of the wheels used by Cofidis using a flatter rim and a 3K carbon weave. The advantage is the weight since a 3K carbon fiber square meter is 175gr while the same area of 12K carbon fiber is close to 205/210gr. 3K price is 50% more expensive than the 12K that is as well 50% more resistant. 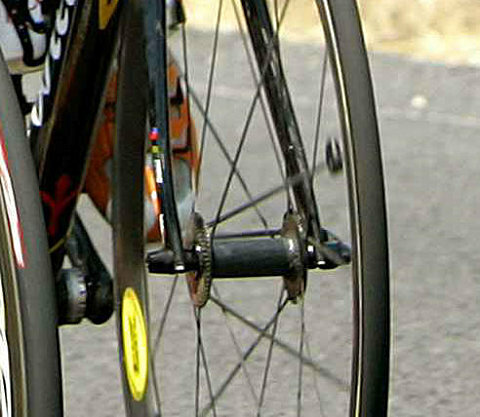 A priori the wheels we can see at the Tour de France are lighter and less resistant than the one tested before. The last year, in this article (only in french) we criticized Mavic that seemed very late concerning the weight of its wheels and the real updates. It seems the company is reacting the best as possible with this wheelset looking like Lightweight wheels. Have a look at this close shot from a picture belonging to Tdwsports. We hope to see these wheels soon in shop at an interesting price. 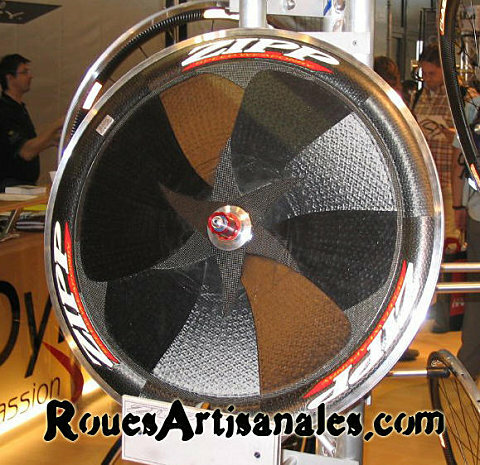 For this second part of the article, we present you this weird Zipp disk wheel. 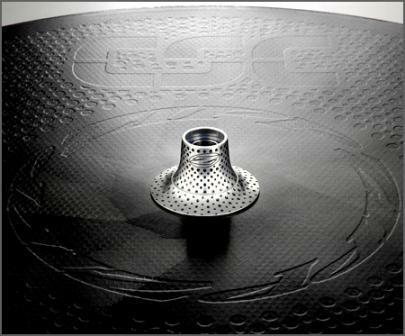 At the moment we don’t have a lot of informations about it but one can notice that it seems to be built upon a normal rim where a fairing has been added to make a disk wheel. Is this a new wheel for 2007? A wheel again faster than the current ones? We’ll know soon. EDIT: this is actually the new 2006 clincher disk wheel. Weightweenies forum is full of informations everywhere. 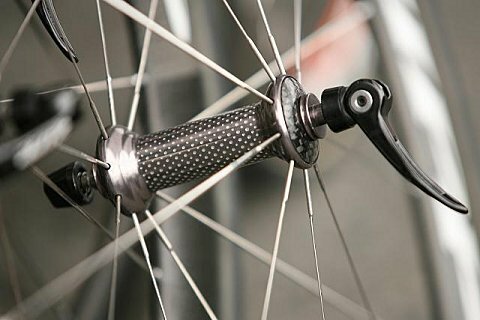 We there found a very nice picture of the dimpled hub we already talked about in this article. Pezcyclingnews also got some informations about the lenticulars wheels that will use dimpled "cones". There are a lot of reactions concerning the dimples on the hubs (saving 3W maximum according to ZIpp) but only a few of them are on the american brand behalf. 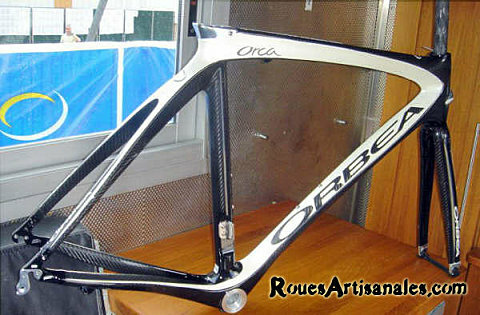 A last thing, Foromtb has been kind enough to send us a picture of the Orbéa Orca 2007 with a little higher quality than the one exposed in this article.